WASHINGTON -- Donald Trump has reached the final phase of his search for a running mate, narrowing his list to three leading contenders and directing his staff to prepare for a Friday announcement. "It's a little bit like 'The Apprentice,'" former House Speaker Newt Gingrich, one of Trump's finalists, said in a Tuesday interview with Fox News Channel. "You find out sooner or later who the last one standing is." Along with Gingrich, a boisterous rabble-rouser who has spent decades in Washington, the finalists include Indiana Gov. Mike Pence, a steady, staunch conservative who would help to calm nervous Republicans wary of Trump's style, and New Jersey Gov. Chris Christie, a one-time rival who has become one of Trump's most trusted advisers. That's according to a person familiar with Trump's thinking, who spoke on condition of anonymity because the person was not authorized to discuss the vetting process. Trump said in a Tuesday interview with The Wall Street Journal that Alabama Sen. Jeff Sessions is also still in the mix. Trump has spent weeks consulting with friends and family as he weighs the most important decision of his campaign to date. He's also met with the candidates and brought his finalists on tour to test their receptions before his crowds. On Monday, it was Christie's turn in Virginia. On Tuesday, he was joined in Indiana by Pence. Trump told The Wall Street Journal on Tuesday he is looking for a "fighter skilled in hand-to-hand combat" as his second-in-command, but hadn't seen enough of Pence to measure his fight. Pence's speech appeared to be an effort from the former congressman to show Trump he could take on such a role. Former Trump adviser Michael Caputo said Pence fit that bill. 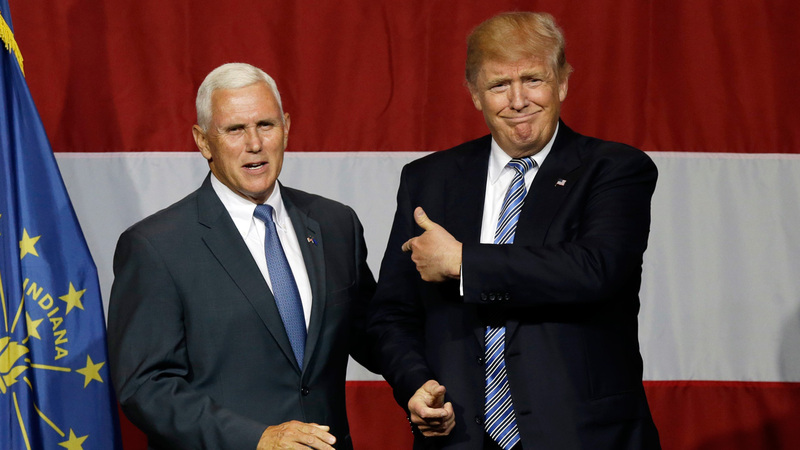 "Not only does he fulfill Trump's requirement for a running mate with political experience, he also is CEO of a company called Indiana," Caputo said. "He's straight out of central casting. He's a communicator. He gets the message, he stays on messages. And he knows how to reach out to a broad range of America." In an interview with The Associated Press on Monday, Trump said he'd narrowed his list to four contenders. He appeared to have made progress by Tuesday, when he told Fox News Channel's Bill O'Reilly that he had "a pretty good idea" of his pick. Still, he appeared to agree with O'Reilly's complaint that his campaign's plans for Friday announcement are ill-conceived, because fewer people tend to watch the news that day. "My guess is you're going to hear either tomorrow or Thursday," Gingrich said. "Certainly no later than Friday, because they're going to want to dominate the weekend news with the new vice presidential selection."